Presenting a 6FT Funny Christmas Reindeer Liberty statue. 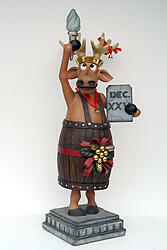 This Christmas Reindeer statue is part of our hand-crafted life size Santa and Christmas decor Seasonal collection. It is sure to attract crowd's attention and is a wonderful conversation piece. This wonderful reindeer statue is made from durable materials using cast resin mold mixed with fiberglass. It is hand painted to the highest detail by professional artisans whose skills have been passed down to them for generations. Dimensions: L36" x H32" x W75"